My husband and I wanted to get married in New York City and weren't sure how easy things would be planning a wedding from another state. But from our first meeting with Jen we knew that we had nothing to worry about. She made this whole experience extremely stress free, she was available whenever I had any questions and she made sure everything was exactly the way I always imagined it would be. We wouldn't have had our wedding any other way, I would HIGHLY recommend Jen to anyone and everyone who is thinking about getting married in the city. Thank you for everything! Xoxoxo, The Gersowsky's. My husband and I eloped from Australia and despite working with the team remotely, things could have have been easier! Jen, our Wedding Planner was very responsive and showed genuine enthusiasm in meeting us and making sure our day was exactly as we wanted it. She provided us a list of recommended vendors for the Officiant and Photographer - and we could not have been happier with our choice for both. She also provided recommendations for a stylist (which was an optional extra I wanted to include) and took some time to help me locate a local bakery that might make us a small wedding cake. Honestly, the experience was perfect in every way and we had an absolute ball! Disclaimer: I freely admit I am a helicoptering, over anxious , OCD mom . Jennifer Schoenfeld with A Central Park Wedding promptly responded to my gazillion emails in the months prior to my daughters wedding. If I ever felt I had an issue or a worry she would reply" I've got this!" I can't tell you how many times my blood pressure would decrease just by reading her emails. The officiant, musician, photographer and beautician my daughter selected from A Central Park Weddings list of vendors were all top notch!The day before the wedding I found out the Global Citizen Festival would be held in Central Park ( Janet Jackson, John Legend, somebody named Cardi B - no haters please my granddaughter knew who she was- and others) The park entrances would be closed , police barricades up, traffic rerouted- yada yada. Talk about a melt down! Jennifer double checked it all and told me we were good to go and we were! She held a walk through the day before and told us all EXACTLY where we need to be, what time we needed to be there and what to do when we got there. I even will give her credit for the beautiful weather we had on wedding day!Ha! She was so personable , organized and efficient from day one. Please go to their web site and see all they offer to prospective brides. I would recommend this company without reservation! Jen was our wedding planner and she is awesome! We decideded to have a ceremony 4 weeks before our wedding date, but Jeniffer and Christina just pulled it off. It was PERFECT. Highly recommended! We decided to get married in the park and Jen and her team were great to work with. They really took the stress away and did not pile on too many decisions at one time. It made the whole process so much more manageable. We made a last minute change to the time and they dealt with all the vendors. The day of the wedding went so smooth and everything we wanted it to be. You’re be pleased to know that we are still happily married after our first weeks together. Both of us have mentioned that we couldn’t have asked for such a fantastic day and how perfect the ceremony was. Everyone had a part, but we have you largely to thank for that. The gift was the least we could do for everything you did (we hope it is something that we bring you a fraction of the happiness that you were able to arrange for us on our wedding day). The Tavern On The Green was amazing and, again, we can’t thank them enough for the event they put on for us. I would recommend them to anyone, for any event, in a heartbeat. We were also amazed at how well the flowers and the cake looked. Please pass on our thanks to the cake makers. Your floral arrangement was amazing. You truly showed your artistic side. To add to my email. A unique experience !! Christa was an extremely professional and helpful person. we were very lucky to entrust her the most beautiful day of our life and everything was perfect !! we suggest to anyone to lean on her for such a special event ... thank you very much !!! I worked with A Central Park Wedding to plan my proposal to my wife to be. We were from Canada and needed some help with various details such as picking the best location, photography as well as overall advice with venues before and after the proposal. Jennifer Schoenfeld and her team were excellent and professional to deal with. They were very helpful with lots of relevant thoughts and very responsive. They also did a great job clearing the park areas where we needed to take photos and made our experience easy, beautiful and smooth. It allowed me to focus on the proposal and making sure it went well and not have to worry about anything at all. I highly recommend their services. Thank you again for all your help. My fiance thought it was the perfect proposal which in the end is all that really matters! 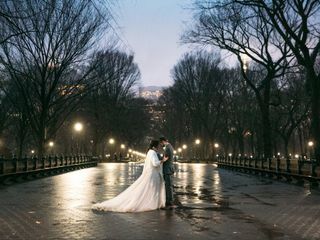 I had a wonderful experience with A Central Park Wedding! I worked with Jennifer, and she was so sweet and patient with me and my family! She answered all my emails promptly and helped me stay organized and relaxed during the planning process. She took care of all the paperwork for the park permit and made everything seamless. She also helped me get in touch with so many fantastic vendors. From the photographer to the officiant, I absolutely loved everyone I worked with. During the ceremony, she completely took over and helped keep my guest organized and well informed. Never once did I have to worry about a thing. Everyone was even complimenting how awesome she was! 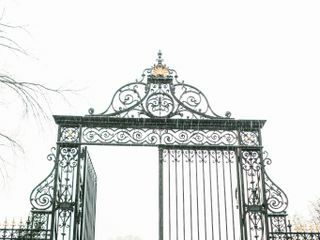 I highly recommend A Central Park Wedding for anyone who needs help with planning their ceremony but doesn’t know where to start. They will take such good care of you, I promise! We don’t know what we would have done without Jen! Jen made the whole process of an overseas wedding a breeze! We were meant to get married in Central Park but the weather had other plans- at the last minute Jen somehow managed to find a beautiful hotel that would accommodate us and even provided champagne! What could have been a nightmare turned out to be the most perfect day all because of Jens quick thinking. Having a wedding planner was the best decision we made in the wedding process. Thank you Jen! Our experience with A Central Park Wedding was wonderful. Christa answered every question I had promptly and kept me informed through the whole process. Every vendor she sent to us was incredibly professional and we were so happy with all of their work. The day of the wedding Christa kept everything moving, got everyone to where they needed to be and made sure everything went smoothly. We did a walkthrough with her the week of the wedding and she even showed us a great weather app that helped assuage our fears that it might rain on our wedding day. Throughout the process Christa was really great about us adding things to our package and pricing things out for us. She arranged our transportation to our reception as well. It was so incredibly helpful to have her to take care of the permit for the park and securing the ceremony location. She was really communicative through that whole process and I know we would never have been able to manage all of that the day of without her. Every step of the process she gave us options of what vendors to use and it was incredibly helpful to choose from a list rather than deal with the overwhelming amount of options available in the city. All of her vendors are top notch. If you are on the fence about using their services definitely go ahead and do it. 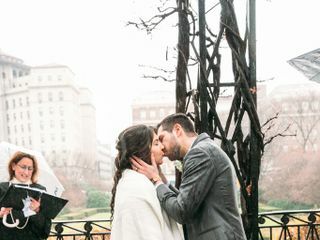 I really am convinced that this is the best way to do a ceremony in NYC at a beautiful location for a reasonable amount of money and A Central Park Wedding is amazing at what they do and our wedding was basically as close to perfect as you could ask for. 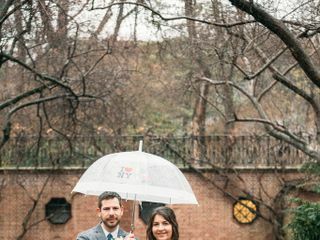 We are an Australian couple who got married in NY in May 2018; and Jen from “A Central Park Wedding” was our planner. I deliberately sought out to write this review because it has to be known how fabulous this woman is. From the minute we met her (via Skype, for our initial meeting), Jen was able to figure out exactly who we were and what we were after - what level of planning we were seeking out, what kind of assistance we required (i.e. narrow down proprietors versus source proprietors, provide recommendations or not, etc etc), as well as our general vibe and wishes for the day. She was all we could have asked for, and more. She intuited our style and interests and was able to make suggestions that we never would have thought of but that were perfect for us. But more than this - she went absolutely above and beyond for us with every single thing she did; traipsing out in the snow at night to visit roof top venues to get pictures for us when she couldn't source them any other way, running out to a stationery store the day before the wedding to make placeholders for the entire reception, and answering emails regardless of what time it was in NY. She was honestly a complete dream to work with - we couldn’t be more grateful for her help, advice and presence on the day; and I genuinely consider her a friend. Do yourself a favour and use this company, you will not regret it. We picked A Central Park wedding as we were travelling from the UK and were unsure how to go about things. Christa has been fantastic throughout the whole process, giving us lots of options with the officiant, photographer & with our musician. When we got meet Christa in New York, she was so lovely and it made us feel like we’d known her forever. She even helped to find someone to do my makeup the night before the wedding day when my original plan fell through. The wedding itself was exactly as we planned and we had a fantastic day. We’ve just received our photographs and they were brilliant too. I would definitely recommend you book your wedding with this company so it’s as special as ours was. We were so thankful to have chosen A Central Park Wedding to look after all our overseas wedding needs! Jen answered every question we had promptly and professionally and put our minds at ease that even in a city we had never been our wedding day was going to go as smoothly as we could have ever dreamed. Even tasks not inside the package weren't a problem...we had trouble trying to find a restaurant that suited our budget and style through google searches, we told this to Jen and sent multiple options through and didn't stop at the first email, we weren't confident on any she had sent through in the first email but she kept at it...talk about service! Once we decided on the restaurant we went to book online but there was an error so Jen so kindly offered to call and book although she ended up going by and booking it in person to ensure it would be the perfect ending to our overseas wedding with a select few family and friends. From the bottom of our hearts thank you so much Jen you are amazing! I wanted to reach out to you and extend my gratitude! I was overwhelmed with love and blessed with all the help I got. You went above and beyond to make this day perfect and that doesn’t go unnoticed. Thank you so much for everything!! Jen was so on top of every single detail - there was a 45 minute delay and I felt zero stress b/c of her calm demeanor. She got the musicians to play specially requested music for us - including Beatles songs. Her responses were warp speed via email. If I ever have another event (or vow renewal) in Central Park I would hire her in 1 second! Two big thumbs up. There are not enough words to express how thankful we are of Jennifer in making our special day so much more amazing than we could have hoped for. She made it a BREEZE and has some amazing vendors she works with! Such a great communicator and a calm spirit which is exactly what is needed during wedding planning. I'm truly sad that we can't work more often together! Jennifer- Thank you again, and again, and again, AND AGAIN over and over for the most perfect day ever!! We had our wedding with ACPW at the Ladies Pavilion in September of 2017, and it was absolutely perfect! We traveled from Tennessee to get married in NYC, and Christa made every step of the process simple and stress-free. We were very happy with every aspect of the ceremony including the location, the officiant, the violinist, and the photographer. Overall, our experience could not have been better, and we cannot thank Christa and ACPW enough for making our special day come to life in such a wonderful way. We highly recommend ACPW! Our wonderful wedding planner was Jennifer Schoenfeld! Where do i possibly start: she did an incredible job perfectly! She put up a wedding for us and most importantly: from overseas! We have never met but I (Bride) had ideas in my head of how it should look like. And Jennifer managed to exceed all my dreams, help me, assist me and be there for me. Every single guest at the wedding asked about Jennifer. Not only because it was the best day of our lives but because she was happy for us. She has an incredible smile that turned the whole wedding into a million! I loved working with Jennifer no question, dream or wish was too much. She was available and pro-active! She is the one that you tell your friends about and they want to become wedding planners! Incredible! Absolutely fantastic. A wonderful smile, gorgeous inside and out and we could have not imagined a partner at this wedding! We love our wedding day and Jennifer! Fantastic! Absolutely fantastic! Thank YOU Jennifer we are so proud to have had you with us - without you it would not have become the memory we will have forever! Jen Schoenfeld is the quintessential wedding planner. Not only was she attentive to details, responsive to our needs and consistently provided high quality service, she took the time to get to know my wife and I as a couple. I believe it's this quality that made our wedding day even more special. With every recommendation she provided and every choice that we made, it was always clear that she was guiding us in the direction that uniquely honored our relationship and vision for the day. I cannot recommend her and A Central Park Wedding highly enough. 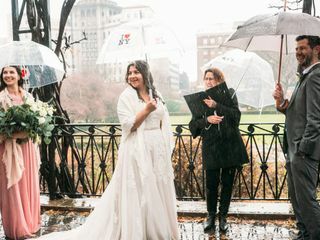 One of the best decisions I made in planning a wedding ceremony in Central Park was working with A Central Park Wedding. Christa was responsive and helpful throughout the process, and worked with me to find the right violinist, flowers, and videographer. She was also flexible in allowing me to book my own photographer and makeup artist even though I initially wanted to book through A Central Park Wedding (we had a split ceremony followed by a reception on a different day in upstate NY and I wanted to use the same photographer and makeup artist for both). On the day of the wedding, Christa was incredibly professional and competent, making sure that guests got where they needed to be, keeping us on schedule, and protecting our private ceremony from curious onlookers. 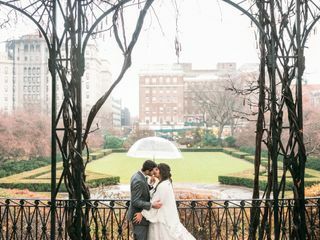 We were incredibly pleased with Christa and A Central Park Wedding throughout the entire wedding planning process, and I can't imagine having a wedding in Central Park without their assistance! We were extremely blessed with work with Jennifer Schoenfeld & we couldn't be happier with how perfect our wedding turned out. Jen was amazing - so flexible & accommodating & just an absolute pleasure to work with. She was always on top of everything, took care of all the details & made sure we were never stressed about anything. Every vendor & service she suggested & provided were top notch & made the day incredibly memorable for us. We couldn't recommend her more if anyone is considering having a wedding in the Park! Christa and her team (and the lucky weather!) gave us the wedding of our dreams. From responding to every question I had over an entire year, to helping us pick an officiant, to walking us through our ceremony, to helping all of our guests on our big day, we could not have had a better person at the helm. We were so grateful. My wife and I could not have asked for a more seamless and outstanding level of service. 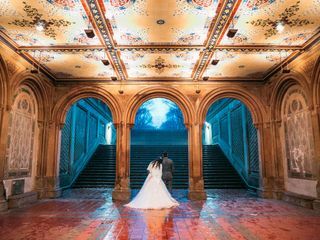 A Central park Wedding is a unique and special experience and the staff were extremely professional and helpful. Coordination with the different vendors was smooth and Jennifer was able to offer us advice to help us make our choices for the ceremony. We absolutely loved our officiant and photographer and they made the day a memory we will treasure for a lifetime. Five stars unreservedly!